It turns out that Jim Munro is leaving the bookstore business after 50 years. That’s not surprising, given that the article states that he is 84 years old. When asked whether he would advise anyone to follow him into the book business, he is quoted as saying “Don’t do it.” Essentially, he chalks that up to how difficult it is to run a physical bookstore, given the competition from online bookstores and ebooks. He is passing the store on to four senior employees, starting this September. They will pay him rent for the 4500 square feet of space, but other than that, he is basically giving them the store and the inventory. The inventory is said to “hover around 30,000 books at any given time”. It is hard to say how to even evaluate an inventory of 30,000 print books these days. A decade or so in the past, they might have each been a potential $10 profit (or more) to a book seller, meaning at least a quarter million in value. But the way things are, they might not fetch even a small fraction of that on the open market. It’s the same for the goodwill of the business – in the not too distant past, the goodwill of a 50 year old going concern would have been worth a lot. Note that goodwill are all those intangibles that an established business has – steady customers, relationships with suppliers, reputation in the community and so forth. But when readers are transitioning to ebooks, all of those intangibles are worth a lot less than they used to be, even though the Munro name is now connected to the prestigious Nobel Prize in Literature (so now it will forever have a place in literary history). · and an inventory that can satisfy the vast majority of niche interests (and is growing bigger and more varied every day)? In my own hometown of Edmonton, Alberta, Canada we have seen one very prominent independent bookstore close down over the past year or so (late 2012 to be exact). That would be Greenwood’s Books, a fixture in the popular Old Strathcona area of Edmonton since the late 1970’s. This was partly precipitated by the death of one of the owners, who was the key business mind behind the store. The others (family) didn’t think they could make a go of it without his business acumen. But it was probably no coincidence that they made that decision when they did – i.e. just as the ebook revolution was getting seriously underway. The remaining big independent in Edmonton is Audrey’s books, also long a fixture, in the downtown area. I can recall special ordering a computer book there in the mid-1980’s. It was where you went for that sort of service back then (Audrey’s or Greenwoods Books). 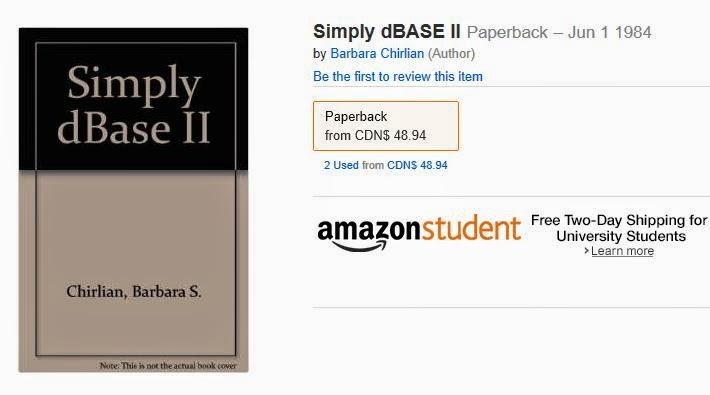 The book was called “Simply Dbase II”. Interestingly enough, it is still available on Amazon (as a used paperback) – a simple Google search was all it took to find that out (see the image below). It makes me wonder who would pay nearly fifty bucks for an old obsolete software manual, but there must be a market. Collectors maybe? It’s amazing what people will collect. I guess that tells you something about business disruption and technological transformation. In this case, Amazon is the preserver of one sort of heritage (the book Simply Dbase II, still available), though it might eventually be the cause of the loss of a different sort of heritage (the physical bookstore). That’s the long tail in a nutshell (to mix metaphors). I have been back to Audrey’s on many occasions since then, of course. In fact, I was recently downtown to take a course in Social Media Analytics (that’s worth a blog itself, someday soon), so I dropped into Audrey’s over lunch one day. It is still there, on 108 Street and Jasper Avenue, at the same location and about the same size as ever. · Audrey’s Science Fiction: 8 sets of shelves X 4 shelves per set X 20 books per shelf = 640 SF books. · Many of these were well known backlist titles: Prachett, Toklein, Jordan. There wasn’t much that a novelty seeking SF reader would find intriguing. · Compare that to Amazon, which had 163,000 SFF (Science Fiction and Fantasy) titles in July of 2014, of which 74,000 were Science Fiction. · In one niche category alone, Romance – Science Fiction, the Amazon Kindle store had over 4,000 titles. It is difficult to see how any store could compete with that. Granted, that also makes it hard for writers to be discovered, but that’s life in an open market. · The lower floor of the store was completely devoted to children’s books and toys. I would say at least half was games and plush toys. I can recall picking up a poetry anthology by Ted Hughes a few years earlier in that location. · There was nothing like that now at Audrey’s (that I could see, anyway), though I noted there were plenty of anthologies by Ted Hughes on the Amazon Kindle store today, many quite reasonably priced. To be fair, though, I didn’t look very hard for the poetry section at Audrey’s on that visit. Also, to be fair, it only took me a few seconds on the Amazon search engine to find dozens of his anthologies. · I noticed that a lot of the bookshelves had books “cover out”, rather than “spine out”. That makes those books more prominent to the eye, but it also covers a possible shortage of inventory. You can make a smaller number of books seem to go further, if they are cover out. · The store didn’t look down at the heels or anything like that. It was clean and pleasant, and the staff seemed to be happy enough. So, you never know. They might be doing ok. I hope so – it is still nice to have a bookstore to drop into, when I am downtown. Anyway, those were my latest field observations concerning the health of the print book store, with special emphasis on the independent bookstore.